Ages 5 through 8. The activities in this book can be used to teach speech sounds, remediate phonological processes, and enhance phonemic awareness. Students practice sounds as they rhyme words, manipulate sounds within words, complete sentences, and tell stories. Minimal word pairs are presented in pictures. In addition to helping students with speech production, the activities target areas of phonemic awareness that are critical for success in meeting academic curriculum standards. This practical resource includes high-interest activities that students can use both at school and at home. Why not integrate phonemic awareness activities with your speech improvement exercises to build skills that are essential for speech improvement and for classroom success. Think About Sounds. The activities in this section can be used to target phonological processes such as voicing alterations, stridency deletion, final consonant deletion, velar fronting, liquid deviations, and cluster reduction. The activities challenge students to rhyme words, change sounds within words, and use specific sounds to complete sentences. Sound Challenge. 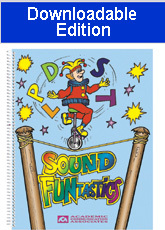 The activities in this section facilitate phonemic awareness as students manipulate sounds in a variety of ways. Example: "Change the last sound in tip to /k/." Sound Contrast Picture Fun. Each page in this section includes two pictures that represent a minimal pair (e.g., pear - bear). Students can be asked to think of words that rhyme with the pictured words or to think of words that have similar features. Listen to the Story. Students are asked to respond to questions relating to the content of stories that emphasize specific commonly misarticulated sounds. Tell a Story. Students are asked to finish incomplete stories, using words with their target sounds. This product is a small PDF file that you can download. If you are unable to open the sample pages in this ad, you need to obtain Adobe Reader before using the file. Adobe Reader is available FREE at www.adobe.com. Orders are listed as "pending" when they are placed. Once payment has been verified, an email will be sent to you. You will then need to log on to your account to view your order. You will see the word "download" in blue next to the product name. Click on the word "download" and select the "SAVE" option. Save the file to your hard drive. It's as easy as that. There is no shipping/handling charge on this downloadable item. Note: This product is also available in a printed book format. See RELATED PRODUCTS link below.